Welcome to Tukwila Parks and Recreation online registration. Recreation programs, classes, and activities developed preschoolers, youth, teens, adults, and senior adults can be registered for online. Facility rentals may also be reserved online, including meeting rooms, banquet spaces, and picnic shelters. For online registration and facility scheduling set up or sign-into an existing account or click on any of the links below. If preferred, you may register for activities and schedule facilities in person at the Tukwila Community Center or call 206-768-2822. Tukwila Parks and Recreation provides diverse recreational programming and activities for everyone who lives, works, and plays in Tukwila. Programs are designed for preschoolers, youth, teens, adults, and senior adults. Program areas include before/after school activities, youth enrichment programs, teen activities, wellness and fitness programs, adult enrichment programs, senior lunch programs, and much more. Several fitness class options, combined with access to a fitness room that contains cardio and weight equipment, is what makes up fitness memberships for adults, families, seniors, and teens. We also work with local businesses and non-profits to create fitness memberships tailored to meet employee needs. Fitness memberships are affordable and designed to meet a variety of interest to help people lead healthy active lifestyles in Tukwila. Fitness memberships may be purchased in person at the Tukwila Community Center and will be available online in the near future. The Tukwila Community Center racquetball court can be reserved online in advance and in half or one hour increments. Reservations can be made online or by calling the front desk at 206-768-2822. Sign up ABOVE by clicking on Community Events! 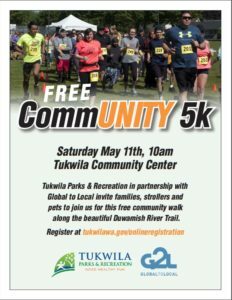 Community Events showcase Tukwila’s cultural diversity, promote health and wellness, and encourage volunteerism. Annual events include: Backyard Wildlife Festival, See you in the Parks, Touch a Truck & Emergency Preparedness Fair, Family Fest, the Spirit of Giving and much more. Click the Community Events link above to learn more about current and seasonal events. Facilities include meeting rooms, classrooms and banquet spaces at the Tukwila Community. Picnic shelters are located throughout Tukwila parks. If needed, a variety of equipment is available for rent including projectors, speakers, and presentation screens. Tukwila is centrally located between Seattle and Tacoma, and the Tukwila Community Center is located adjacent to I-5, I-405 and Route 99 corridors.